We went behind the scenes at the L'Oreal Paris EverCurl video shoot where wavy, curly and coily models got hair makeovers from L'Oreal Paris expert stylist Johnny Lavoy. Saraya had her curls transformed and gave us the inside scoop along the way! NC: Have you always worn your hair curly? Saraya: Yes, I haven’t put in any chemicals on it or done anything to it besides keeping it curly. NC: What have your biggest challenges been? Saraya: My hair has so much volume and is so thick. According to the weather and the temperature, it can react a million different ways. If it is rainy outside, I can pretty much only put it up in a bun or it looks so frizzy and huge. NC: What types of products does your hair like best? Saraya: My hair likes leave-in treatments or leave in conditioners. I sometimes use an oil spray or sheen if it looks a little dry. But usually, creams work best. NC: What’s your go-to curly styling technique? Saraya: My go-to styling technique is what I do every time I wash it. I dry it and use a leave in conditioner. Then I comb through it with my fingers to separate the curls and let it air-dry so that I have more defined curls. L'Oreal Paris brought in their consulting hair expert Johnny Lavoy to give Julia's waves an EverCurl makeover. Here's what he had to say! NC: What does this model’s hair need? Lavoy: Saraya has beautiful curl, it just lacks definition. So my goal is to get her naturally curly hair frizz-free and well defined. NC: What’s your top tip for styling curly hair? Lavoy: Let hair dry naturally after applying your L’Oreal products and DO NOT manipulate it. People make the mistake of trying to scrunch the hair when it is drying and it only creates frizz. If you don’t have time to let it dry naturally, get a diffuser. NC: Which products do you recommend for curly hair? Lavoy: For women with curly hair, I recommend using a suite of products: The Hydracharge Shampoo and Conditioner, Hydracharge Leave-In Cream and the Sculpt & Hold Cream-Gel. This system provides 48 hours of frizz control and curl definition. The system is also infused with Hibiscus and Grapeseed oil which locks in intense moisture. Apply the Hydracharge Shampoo to wet curly hair and massage gently into a thick lather. Rinse with cold water. Follow with the Hydracharge Conditioner. This conditioner quenches and softens, perfecting hair’s shape. It infuses hydrating nourishment without weighing hair down. 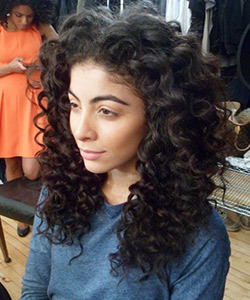 Curls are left softer and more manageable without frizz. Then apply 1- 2 pumps of Sculpt & Hold Cream Gel. This unique cream-gel styler combines the care of a rich hydrating and conditioning cream with a styling gel that shapes without weighing hair down. Ultimately, curls remain smooth and hydrated. After you finish applying the cream-gel use a microfiber towel to scrunch out the excess product. Air dry or diffuse on a cold setting. NC: How did EverCurl help solve your hair challenges? 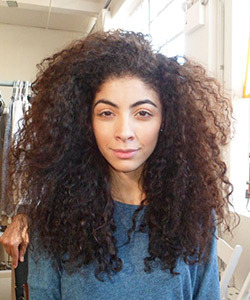 Saraya: EverCurl helped solve my challenged by locking in moisture in my hair and by giving my curls better definition. NC: What tip did you learn that you’re going to try at home? Saraya: I shouldn’t mess with my curls too much when it is drying. I shouldn’t even run my fingers through it or fuss with it too much to avoid creating frizz.